Sharks may have a reputation as the planet's most intimidating predators, perfectly designed for life at sea -- but sometimes they too can use a helping hand. Fortunately, there are folks out there bold enough to offer them one. 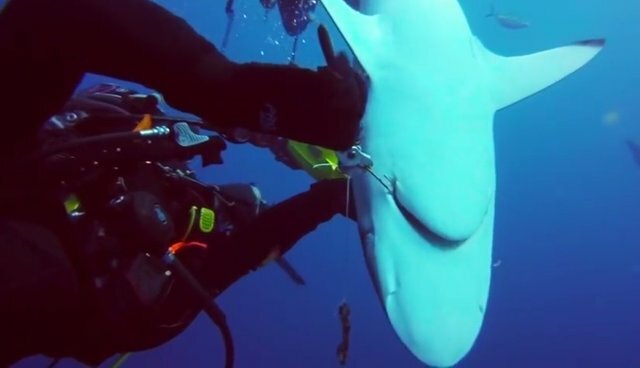 Divers from the group "Shark Addicts" were out exploring the waters off of Jupiter, Florida over the weekend when they encountered several Silky sharks. After they noticed that one of animals had a large fishhook protruding from the corner of its mouth, they risked their own safety to rescue it. "Everything went successful, the shark was not harmed, and no divers were harmed. We plan on doing this more in the future," writes the group on YouTube. Silky sharks have been known be aggressive enough to pose some danger to swimmers and divers, though, as is the case with virtually all shark species, attacks are far rarer than most people might assume.